There are few restaurateurs that have had as dramatic an impact on the way this country eats than Alan Yau. The man who created an impressive number of famous restaurants such as Michelin-starred Chineses Hakkasan and Yauatcha, and plush Japanese Sake No Hana in St James (though not still involved day-to-day with very many of them), he is perhaps best known for being the founder of the extraordinarily popular Wagamama chain, which has so many branches now up and down the country - and around the globe - that they're almost as almost as ubiquitous on the high street as Boots or Marks & Spencer. To be honest, I'm not a fan of Wagamama - it's timid food served as quickly as possible, and the bench seating is infuriating for a number of reasons - but then I'm a snobby Londoner with access to places like Koya and Chilli Cool; I can easily see why they've been so popular elsewhere. So the guy has a decent track record. 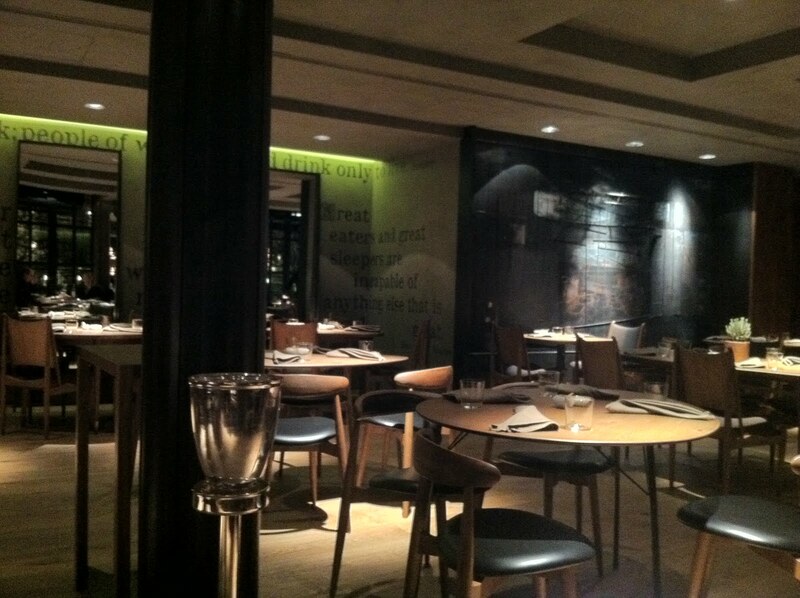 And he has been very successful, perhaps thanks to the very clear set of expectations crafted by his restaurants. So far, each has filled a certain specific role; Hakkasan is posh Cantonese, Yauatcha is posh dim sum, Saka No Hana is posh Japanese. 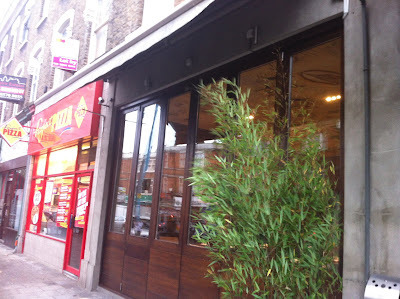 Similarly, Wagamama is budget Japanese and Busaba Eathai is budget Thai. So presumably Cha Cha Moon is budget Chinese except - what's this on the menu - Dolly mee goreng is Malaysian isn't it? And Fujian style udon is most definitely Japan. There's Thai chicken curry, Sichuan chicken, Singapore fried noodles, Indonesian satay, baby back ribs!? - geographically, it's all over the place. And if you think that pan-Asian restaurants are doomed to mediocrity because no one kitchen can master such a wide range of styles of cooking, Cha Cha Moon is unlikely to change your mind. First thing to arrive - dishes are just brought out as and when they are ready - was a warm crispy duck salad. I suppose the duck was technically crispy in that it had been deep fried to near-oblivion, but thanks to the shredded flesh soaking up the fryer oil like a sponge, it was unbelievably greasy. The salad itself was dressed in what I can only assume was simple syrup as I didn't detect anything other than sugar, and while ordinarily I'd compliment their generosity on such a large portion for your £7.90, in this case it just meant there was more sickly, greasy gunk to wade through. Hideous. Singapore fried noodles were better, but then so is driving a ten-inch cook's knife through your thigh. It was a bit sweet, a bit bland and despite being marked on the menu as "spicy" we couldn't detect even the slightest hit of chilli, but at least it was fresh and just about edible. Still, this was the kind of thing you could get from any High Street Chinese takeaway in the country, absolute bog-standard fare, and was £6.90. These spring rolls tasted exactly like the ones you can get in the plastic cartons from Tescos. That's not to say they were in any way inedible, I just have this old fashioned notion that people visit restaurants to eat food they can't reheat themselves in the oven for a quarter of the price. They came with some kind of tamarind-based dipping sauce that made them taste of tamarind-based dipping sauce instead of spring rolls. We used up all of the sauce. I can't begin to tell you how awful the baby back ribs were. The cloyingly sweet sauce (described coyly as "tangy" on the menu) they came soaked in wasn't enough to cover the appalling smell of commodity pig and the meat was so overcooked and formless it was like eating rancid pork-flavoured blancmange. Unspeakably bad, and although perhaps nothing can quite beat the ribs at Hard Rock Cafe for sheer catastrophic terror, these weren't far off. Pitt Cue in Soho is still the only place in town I've eaten ribs of any kind worth paying for. 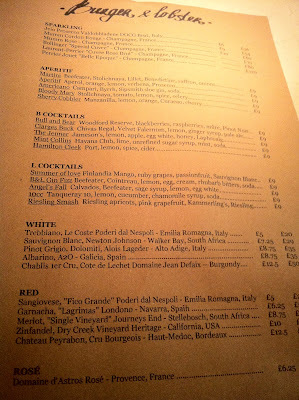 We drank sickly lychee-flavoured cocktails and cheap white wine, as you tend to do in these places, and after gamely working at the more edible elements of the food, scurried off wondering what on earth just happened. Alan Yau has dropped so many balls with Cha Cha Moon the streets of Soho could be used to film a Sony Bravia commercial. With its directionless, geographically vague menu, timid and incompetently prepared food, and piercingly loud room fitted with those dreaded communal bench seats, it's hard to find anything even remotely positive to say about the place. Oh - the staff were very pleasant and there were lots of them so you never had to try to hard to get their attention. But for God's sake, even the toilets were shoddy - Alan Yau's places are famous for always having nice toilets, even the budget ones. It's baffling, and my meal was miserable, but all said and done, this is Soho and alternatives are hardly in short supply. Eat somewhere else. Eat anywhere else. I went to see new movie The Artist on Saturday evening. Even if you've not seen it yourself, you will most likely have heard of it - the slavering reviews, the cavalcade of awards, the Oscar buzz. The friend I went with told me that her colleague declared it "the most perfect movie he'd ever seen", and to compliment this most nostalgic of shows we'd selected the best seats at the wonderful old Ritzy cinema in Brixton. So I think it's fair to say our expectations were high. It was a good film. I liked it. I think my friend liked it too. A nice, light-hearted period piece set in the early days of cinema, a good few chuckles, some dancing, a straightforward love story and a Bit With A Dog. A very pleasant way to spend the evening. But I would hardly put it in my top 5 films I've seen this week, never mind of all time, and left completely baffled about the attention it's been receiving. Is The Artist really the best film of 2011 and I'm just a joyless misery guts that can't appreciate a good thing when he sees one? Or, was I simply expecting too much and nothing could have lived up to it, no matter how good? 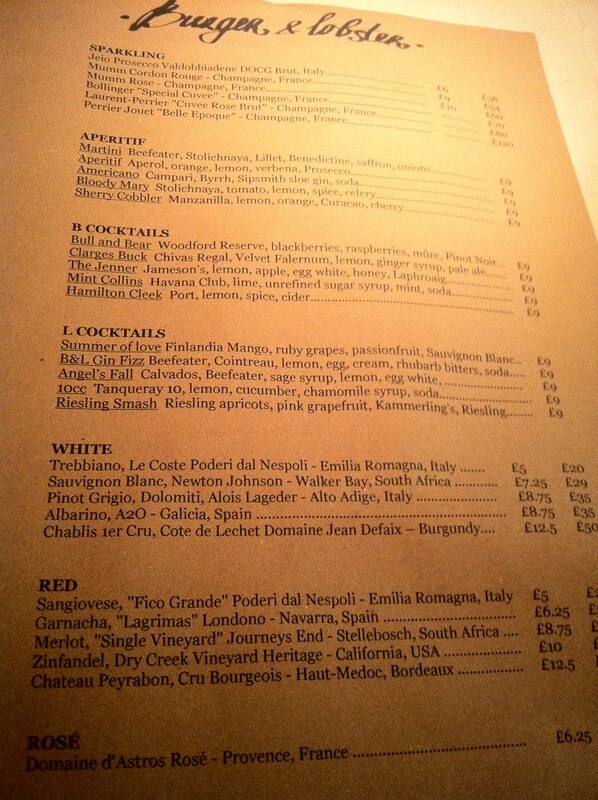 Which brings us to Hedone. Executive Chef Mikael Jonsson is that rarest of things - a food blogger and obsessive foodie who gave up his previous (presumably more generously paid) job, and, by the looks of things, his blog, to open a restaurant that would serve the kind of food he wanted to eat. And, being an obsessive foodie, what he wants to eat is nothing less than the finest ingredients he can get his hands on, cooked in a way that makes the most of them. 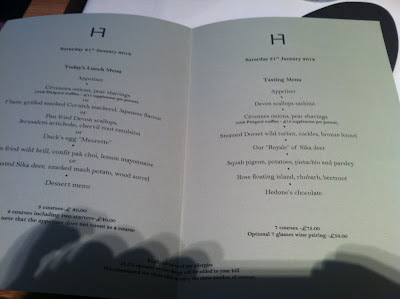 I remember reading his blog in the days before I'd started my own - it would contain vast, 10,000-word reports on multi-Michelin starred meals in Paris and Berlin, with the kind of detail and expertise more usually applied to open-heart surgery than dinner, and I found it all completely fascinating. So, above all else, congratulations to Mikael for having the guts to offer up his own cooking for critique, as he must know what he has coming from other bloggers too lazy and talentless to ever cross the Great Divide themselves (ie. me). 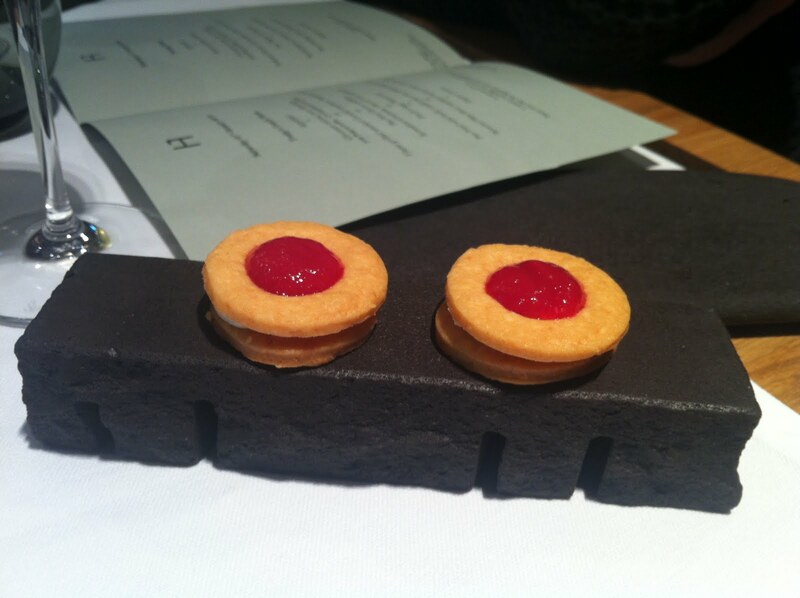 The amuse was literally that - a culinary joke which looked for all the world like a sweet Jammy Dodger but actually consisted of savoury cheese biscuits sandwiching a thin layer of sharp ewe's milk cheese, topped with a sharp red berry coulis of some kind. I realise I'm doing a huge disservice to the amount of fanatical care that has gone into sourcing all the food at Hedone, but quite frankly if you ever came to this blog looking for informed food journalism you were on a hiding to nothing. 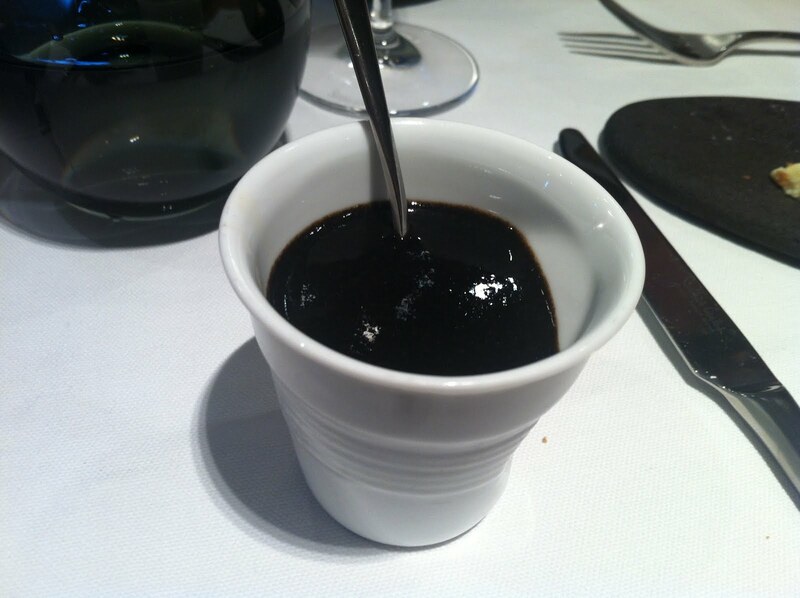 Next, a teeny cup of ferociously dark seaweed sauce which topped a thick savoury custard which I think involved some kind of cheese (more of that top-notch food journalism for you there). The idea behind this was to provide a heavy umami hit to get your taste buds going before the main courses started arriving, and though I can't vouch for the science of it, I thought it was great fun. Devon scallops sashimi was a pretty little dish, containing carefully balanced textures and delicate splashes of colour, but I'm afraid I wasn't hugely impressed by the flavours. 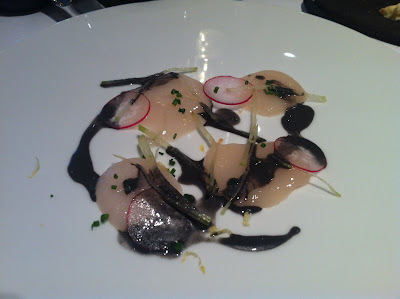 Raw scallops aren't my favourite thing in the world - I just think they're always better cooked - and while I'm sure these were the finest examples money can procure, I found them dense and bland. Rocks on watercress jelly was better, though. 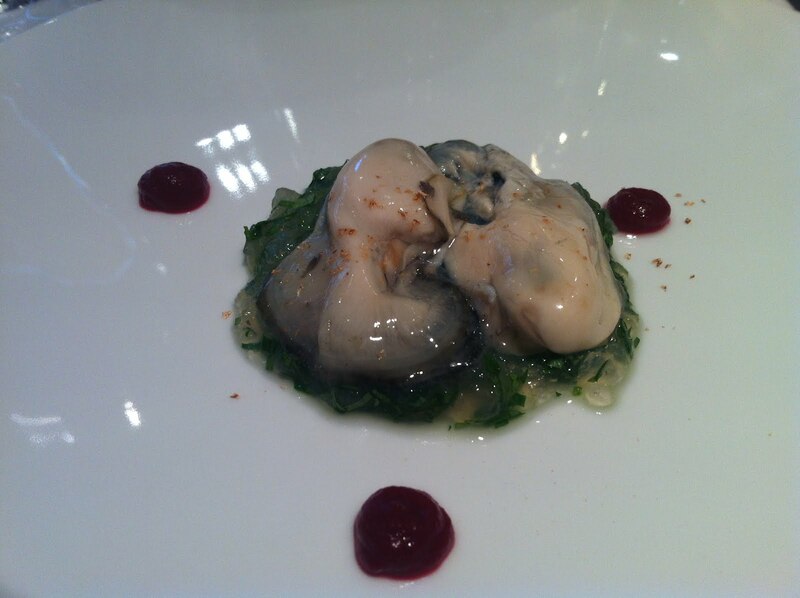 Raw (or at least very lightly poached) oysters had an absolutely fantastic fresh flavour, and combined with the ever-so-slightly-peppery watercress and a few dabs of what I think is the same red berry coulis that came with the Jammy Dodgers, it all added up to an interesting and rewarding dish. 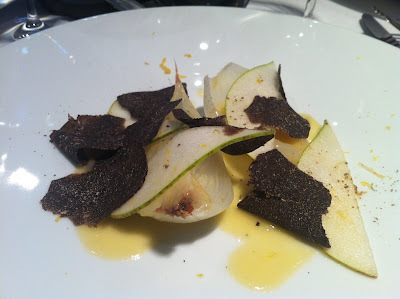 Cévennes onions, pear shavings (with the £15 Périgord truffle option naturally) I knew would be the dish that made up my mind about Hedone. You have to have supreme confidence not only in your own ability to showcase world-class ingredients but also confidence in the customers who will be paying a lot of money for a plate of onion and pear to recognise the quality in those ingredients, and appreciate them. I'm sure there will be enough people out there who do, as well, I'm just not one of them. To me, it tasted like warm onion and shaved pear with some nice black truffle on top - not unpleasant, just unremarkable. What am I missing here? 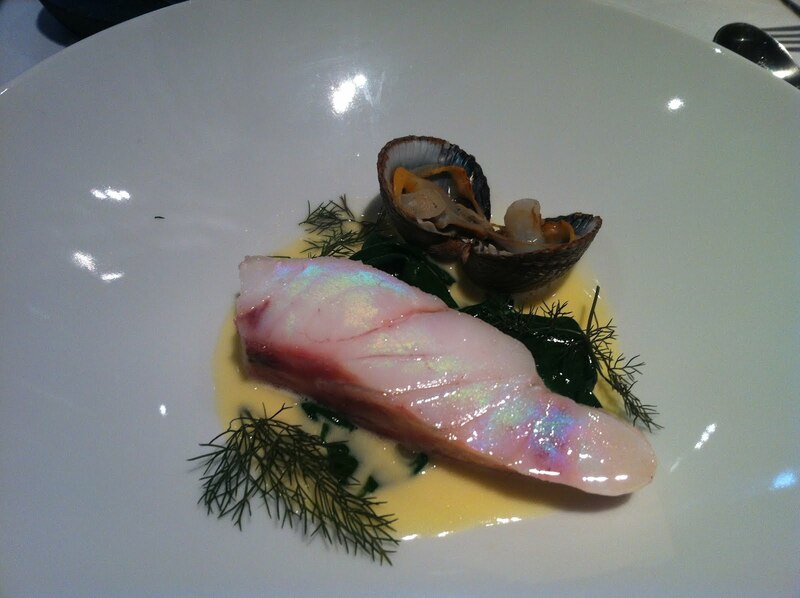 This mother-of-pearl effect on the turbot flesh is, we were told, an indication that this most precious of beasties has been cooked to perfection. 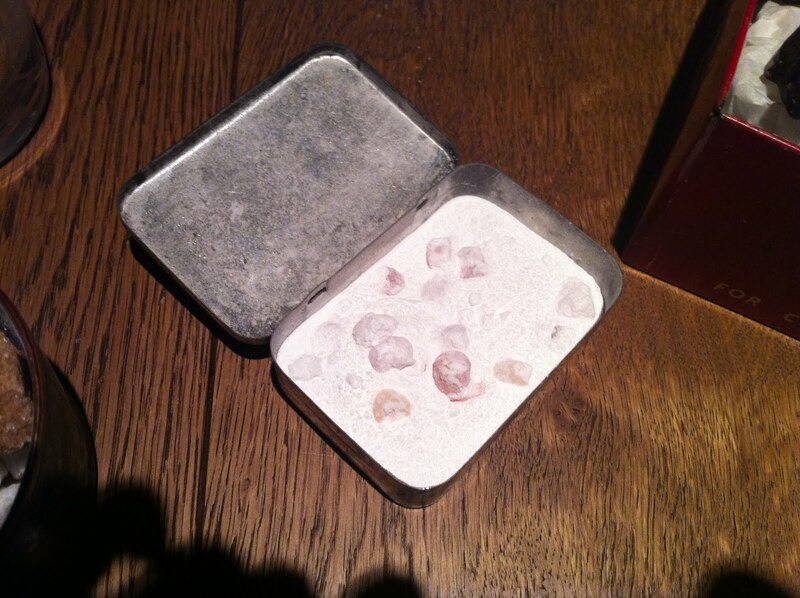 It certainly had a great flavour, and a remarkable texture - dense without being dry, and flaking apart beautifully. The seaweed (I presume... don't nominate me for the Pulitzer all at once, now) underneath seasoned the fish very nicely, and a slightly grizzly-looking clam topped it all off. 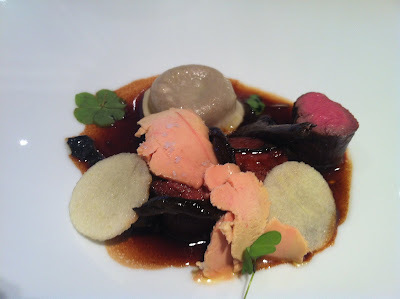 Sika deer "Royale" was, for me, the highlight of the meal. A delicate "raviolo" burst under the slightest pressure in the mouth to reveal a rich game soup filling. Beautifully cooked venison, bright pink loin and a different slow-cooked cut, had the most intense flavour of any I've ever eaten, and was all soaked in one of those classically French reduced sauces that packed an incredible punch. 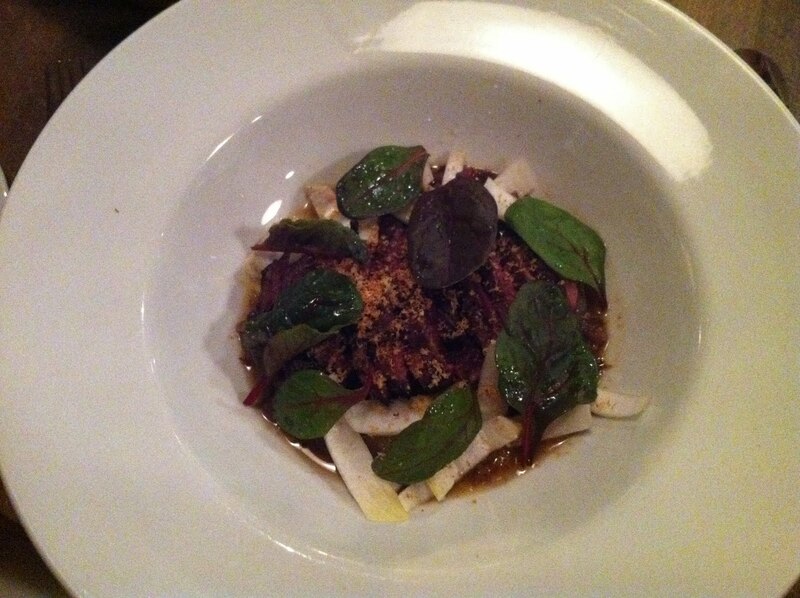 As if all that wasn't enough, there was some gorgeous shaved foie gras on top to add extra meaty butteryness. Beautiful. 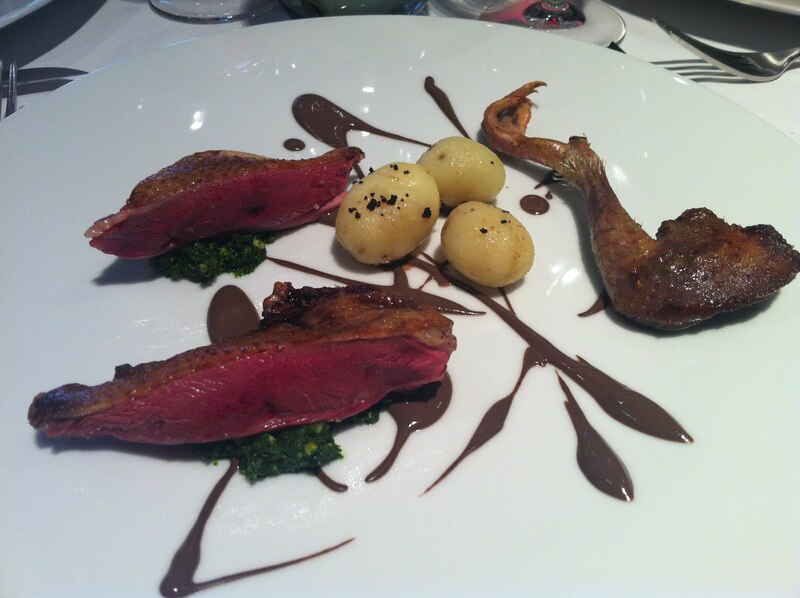 Squab pigeon was, again, technically faultless - flavourful and attractive and presented as two cuts of breast and a roast leg. I ate it all quite happily, I just think it suffered slightly in comparison to the pigeon I'd had at the Ledbury a few months ago where they debone the leg and turn it into a meat lollipop. Chewing around the sinew in this one was harder work, but perhaps I'm nit-picking. 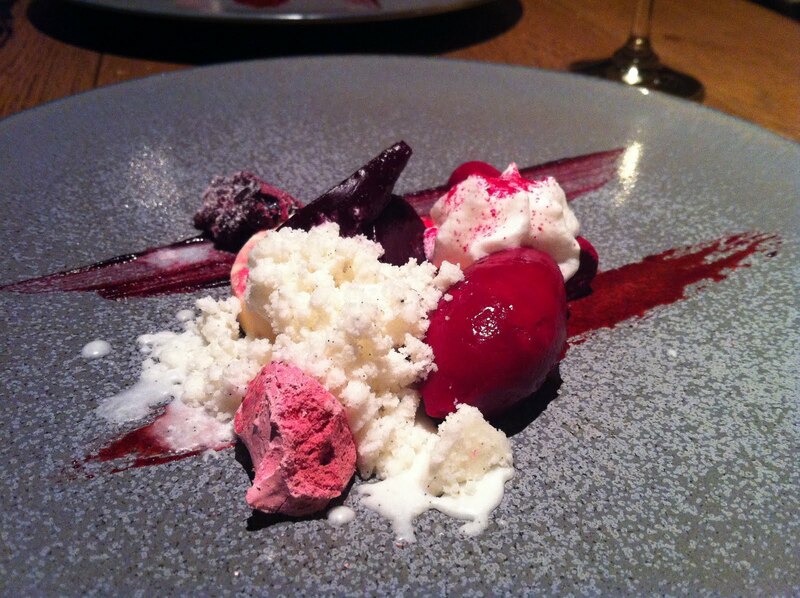 What is it with fancy restaurants and beetroot desserts recently? Rose floating island, rhubarb and beetroot was, fortunately, a lot nicer than the dish at Tom Aikens, though I definitely preferred the gorgeous sweet rhubarb sorbet and the soft meringue-y base to the disconcertingly earthy beetroot sauce. Also, I couldn't detect any rose flavour but can't say I missed it. 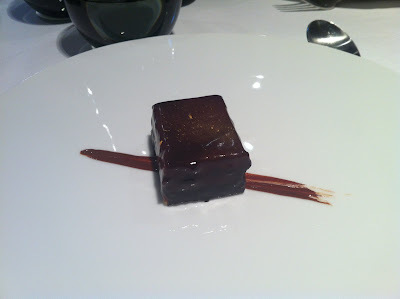 This second dessert was, with the flecks of gold leaf on top, reminiscent of Alain Ducasse's famous Louis XV creation from his restaurant in Monte Carlo, but just like the version I had at Gauthier Soho I couldn't quite see what the fuss was about. It was a perfectly decent chocolate dessert and I finished it off quite happily, it just wasn't particularly memorable. We didn't have a huge amount of wine, just two bottles (one of each) between four and I think a couple of people had coffees, but the bill still somehow managed to come to £120+ a head. 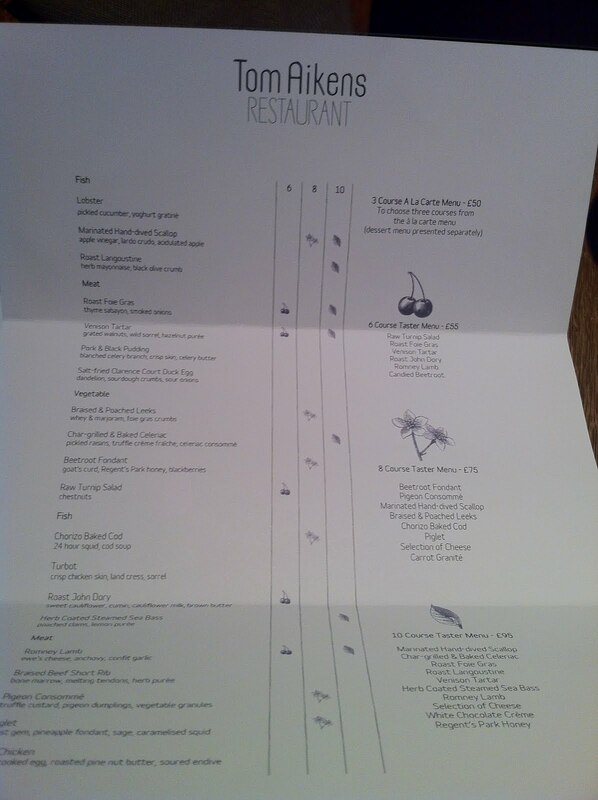 In fairness, in the context of the obvious commitment to world-class ingredients (I'm reliably informed Jonsson is charging far less for some of these super-premium items than his accountants would like), the superb service and the very attractive room, this is understandable but I can think of a few other spots in London I've had more satisfying meals and on a far less eye-watering total. This ingredients-led, precise, formal, even reverential style of cooking will, indeed does, have its fans but I couldn't help spending most of the afternoon wondering if I was suffering from some kind of palate-blindness. It was like being in the audience of an experimental modern Jazz quartet, standing baffled and uncomprehending whilst all those around me enjoyed a life-changing experience. After we'd emerged, baffled and uncomprehending from a sell-out screening of The Artist in Brixton, we nipped around the corner and joined the back of the queue for Franco Manca. After 15 minutes or so wait, we sat down and ordered a pizza each for £7 ish, a glass of £1.80 Pinot Grigio and a glass of their homemade lemonade for the same. I still maintain that the pizzas from Franco Manca Brixton (have heard mixed reports from the other branches) are the best it's possible to pay for in the capital, the sourdough bases sweet and crispy and smoky, the toppings fresh and bright, the atmosphere convivial and rustic. And call me an inverted snob (you won't be the first), but I enjoyed that pizza much more than I'd enjoyed lunch in Chiswick, and not only because it cost fully twelve times less. I am convinced, objectively, that Hedone is a very good restaurant, possibly world-class. But I think I'd rather have a pizza. Sorry. I never visited the "old", pre-refurbished/relaunched Tom Aikens. I believe he once held two Michelin stars at Pied a Terre, which whatever your thoughts on Michelin (and I have many) is impressive, and I can only suppose you have to possess a certain amount of nouse to run three (as far as I know) successful restaurants. Other than this I had few preconceptions about his ability as a chef; what I do have preconceptions about is this. In 2008, finding himself owing a large sum of money to a number of small producers (the true amount is still unknown but thought to be a good deal over £100,000), Aikens exploited a legal but morally questionable loophole in the way restaurants interact with their suppliers, declared himself bankrupt and carried on trading under a different company name. Many of those suppliers suffered greatly, some even went under, and the damage done to his reputation was incalculable. His PR team must wince every time the bankruptcy gets brought up but however much I'd prefer not to open old wounds, the fact is that the actions of Aikens the man have a nasty habit of overshadowing anything coming out of his restaurants' kitchens. If you put your name in lights above the door, you surely must expect that extra scrutiny, but it's surprising just how strong the feelings he excites still are - the briefest of mentions on Twitter that I was headed to Aikens' eponymous restaurant in Chelsea provoked a flurry of angry links to the Telegraph article above; clearly this is a man who continues to divide opinion. So that's the backstory. 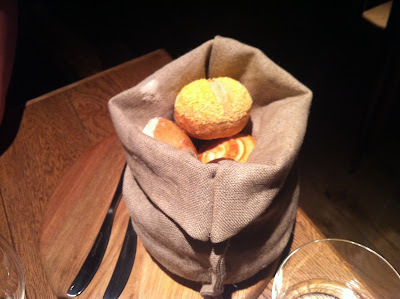 The latest chapter, or so they'd like you to believe, is that Tom Aikens has humbled-up and gone "more informal". In terms of the decor this means goodbye to the old starched white linen and soft furnishings and hello to bare wooden tables and stencilled quotes about food on the walls, but more interesting is what's happened to the food. Perhaps mindful (or jealous!) of the attention lavished on the new wave of London restaurants like Roganic and the Young Turks, the new menu leans away from classical French and towards foraging, British ingredients and arty, Noma-style presentation. Lovely fresh house bread was presented with three types of butter (our favourite had bacon bits in it, rather Viajante-like) and a tray of canapés, once they arrived (we were sat 35 minutes before any solid food arrived, but service settled down a bit after that) were universally admired, particularly a stunning teeny bowl of duck and truffle soup. Raw turnip salad with chestnuts was light and fresh, although I could have done with more of the buttery chestnut paste smeared around the side of the plate and less of the fairly bland vegetable consommé poured on top. There was plenty of texture here, even some chunks of savoury jelly floating around, but this was in the end one of those "filler" vegetarian courses and not really strong enough to stand up in its own right. Roast foie gras with thyme sabayon and smoked onions was much more successful, in fact I can barely remember a better cooked piece of cruelly-force-fed goose liver. 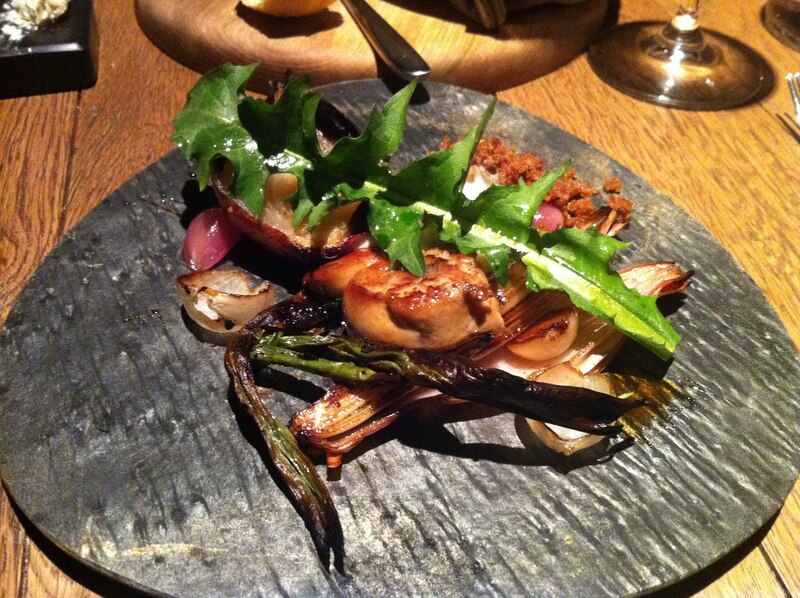 The ethereally-light foie, which dissolved in the mouth like hot butter, was served with crunchy charcoal-blackened onions, a pairing which brought out the absolute best in everything on the plate. 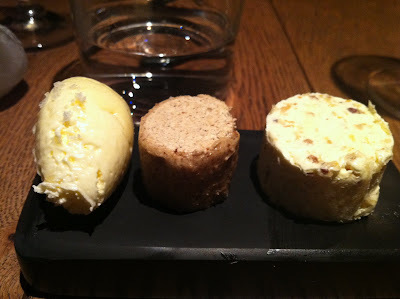 I loved this; if nothing else, the guy certainly knows what to do with foie gras. 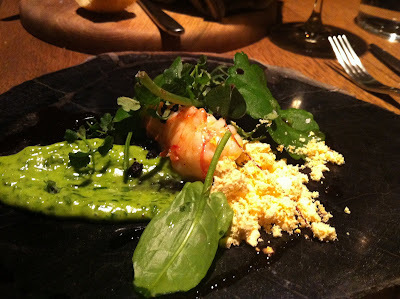 Roast langoustine was a tad dry perhaps but a green slick of powerful herb mayonnaise made up for it; there was also a dusting of Can Roca-style prawn powder for a bit of extra interest. 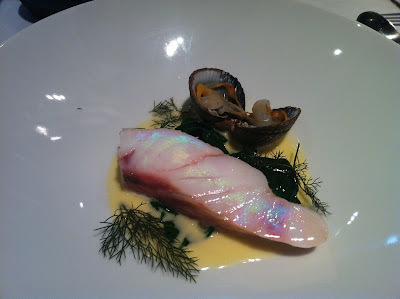 I was looking forward to seeing if turbot with chicken skin would work - it certainly sounded interesting - but I'm afraid I'm still in the dark as this course was disastrously overcooked and dry. There could be a number of reasons for this but prime culprit is the appearance of AA Gill at a table for four in the corner; staff were struck with such abject terror we actually noticed them shaking. 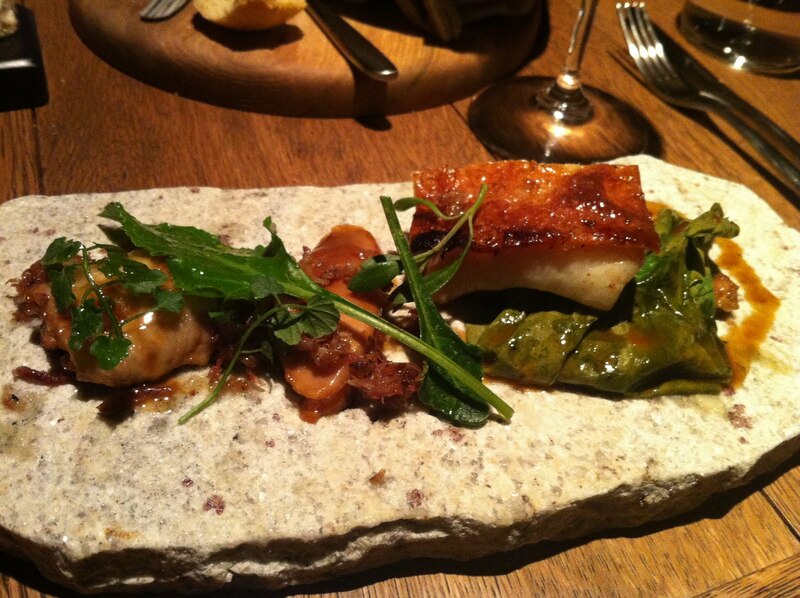 Anyway perhaps turbot and chicken skin is a brilliant and brave combination, or perhaps it isn't. Who knows. 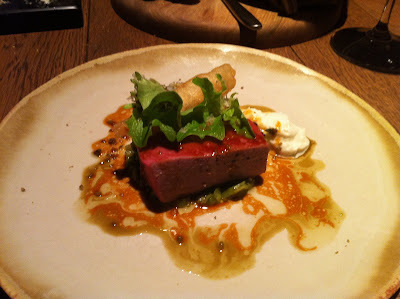 Next, a lovely pink cube of Romney Lamb was served with a blob of tangy ewe's cheese and a battered anchovy. This was a clever take on the famous lamb and anchovy combo, and I rather enjoyed it despite the lamb being slightly on the tough side. 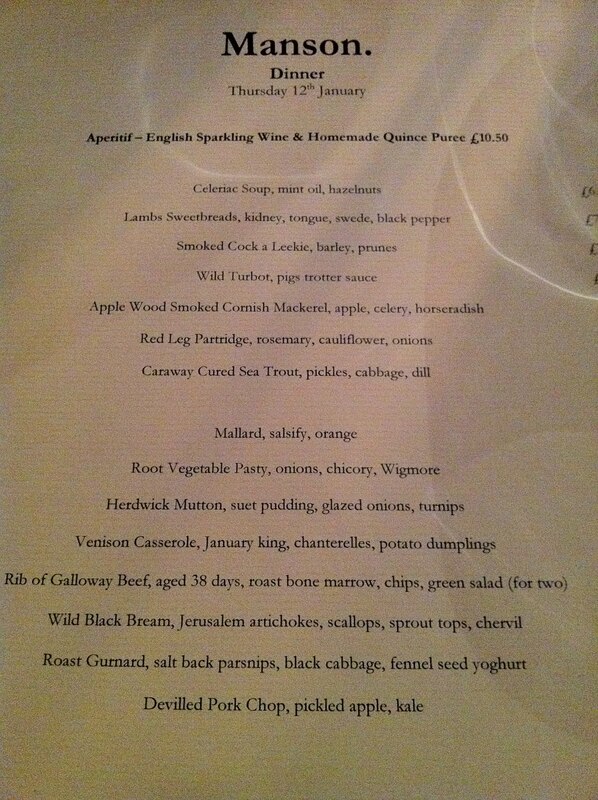 Having spotted it lurking on the menu I admit to fretting about the beetroot dessert - yes that's "beetroot" and "dessert" - for most of the meal, and it turns out my fears were quite well founded. I'm all for experimentation and pushing the boundaries of modern British cuisine, but trying to make a meringue out of beetroot is, I'm afraid, not the future. It was very odd, in fact I'd go so far as to say deeply unpleasant, and all the more psychologically distressing because due to the colour of it you kept hoping it was raspberry or blackberry you were eating, and not root vegetables. Full marks for seasonality I guess, but where will it end? Turnip sorbet? Brussel sprout pavlova? Cabbage pannacotta? 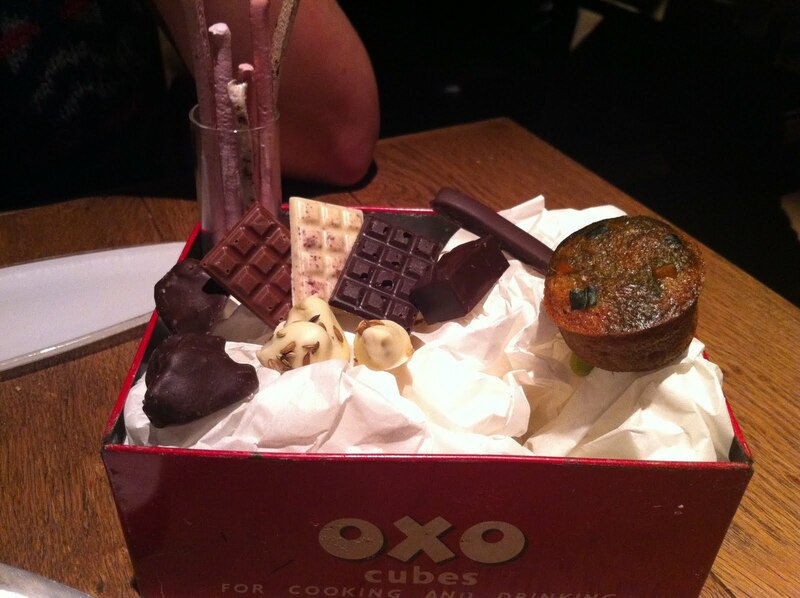 Petits fours were decent - a generous selection of chocolate covered things in a cute vintage OXO cube box, and incredibly citrusy jelly pieces in a separate little metal tin - but not really anything to set the pulse racing. 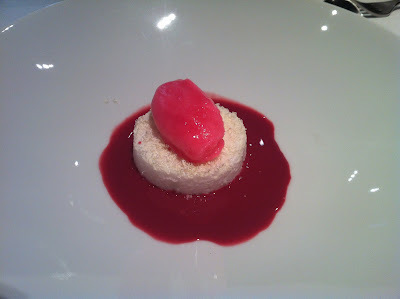 More beetroot meringues were lurking amongst the bits and pieces but we studiously avoided them. 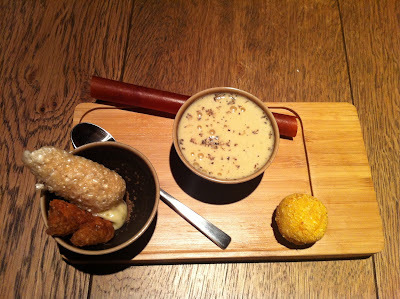 What's clear is that Tom Aikens (or at least someone at Tom Aikens) can cook; there were enough highlights - although only just - in this very variable meal to prove that. 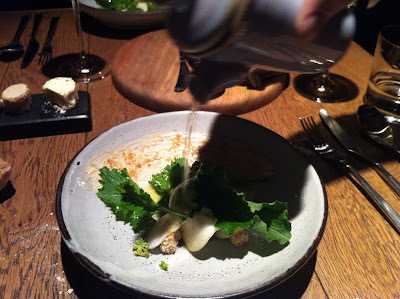 And it's entirely possible that, having had a life-changing meal at Roganic (they generally are) or Noma he had some kind of Damascene conversion and decided from now on it's all about foraging, unusual vegetables and savoury desserts. But I can't shake the niggling feeling that this most wiley of restaurateurs' attempts to reinvent himself as a trailblazing champion of Nordic cuisine is less about where his talents really lie and more about good PR. 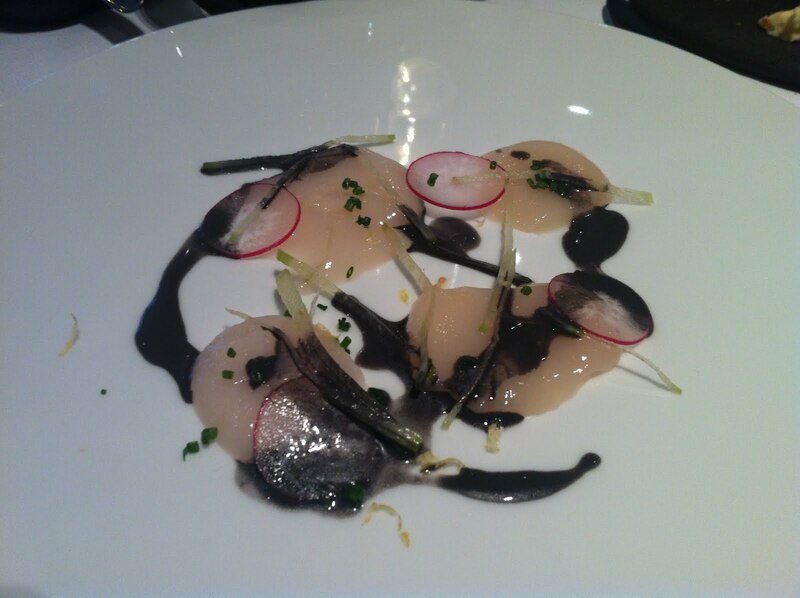 It was the more recognisably French and Haute Cuisine moments in the meal (the stunning foie gras, the lamb and anchovy) that worked, and the more obviously outside-influenced ones (the turnip salad, the beetroot dessert) that didn't. But the staff were lovely, the newly rustic interiors are impressive and despite everything that wasn't perfect, we did enjoy ourselves. And perhaps you will, too. Just avoid the beetroot dessert. As a child, starved of entertainment on long car journeys through France on family holidays, I would often find myself flicking through the Michelin Guide. And much like the way I occasionally now browse the Foxtons website for the most expensive properties on their books, just for the sheer masochistic delight of discovering what £32 million can buy you in SW6 (come on, I can't be the only one), I would find myself drawn to the flashiest places in the Red Guide; the 3 star restaurants and the 5-red-tower hotels, strange make-believe places like the Crillon (Paris) and the Carlton (Cannes) that existed in a glittering parallel universe I could only dream about being a part of. Our own evening meals on the road, needless to say, generally consisted of a 70F set menu in the nearest cafe to whichever prefabricated chain hotel we found ourselves in, but the details I soaked up from the short descriptions underneath whichever gastronomic temple was top of the list that year led me to a lifelong obsession with lobster. They seemed to be everywhere in that book, and always at the most expensive places - lobster, along with a couple of other ingredients (caviar, truffle), was shorthand for glamour and decadence, and as I was (still am) desperately superficial, I was hooked. As for burgers, that's a little easier to explain. My parents, with only the best and very sensible intentions I'm sure, refused to take me to McDonalds, and the only times I ever managed to breach this embargo was when children of slightly less neurotic families would invite me to sit in the plastic boat upstairs at Southport branch, wear a little cardboard hat and eat cheeseburgers and fries until I was sick. There's something about McDonalds that hits every single pleasure spot in a child's brain - it's crack for the under 12s - and these rare occasions burned so bright in my formative mind that even to this day there are few more sinful pleasures I indulge in than the occasional Quarter Pounder. I don't care who knows it - it's salty, greasy, packed with evil chemicals and everything that's wrong with the way people eat in the 21st century but I bloody love it. Also, anyone who thinks McDonald fries aren't the best are snobs. So there. So, there's a new restaurant in Mayfair called Burger & Lobster and it's as if my whole life has been leading up to this moment. 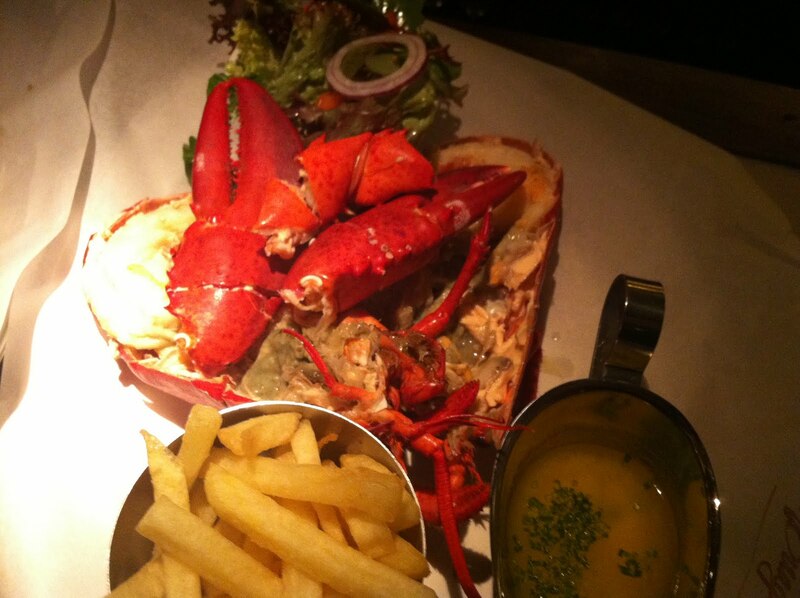 It serves, at £20 per item, a whole lobster, a lobster roll, and a burger. Each come with salad and fries. The burger is rich and bloody, the umami hit of the aged beef strengthened with (so it's rumoured) a splash of Thai fish sauce, though not enough to be distracting. 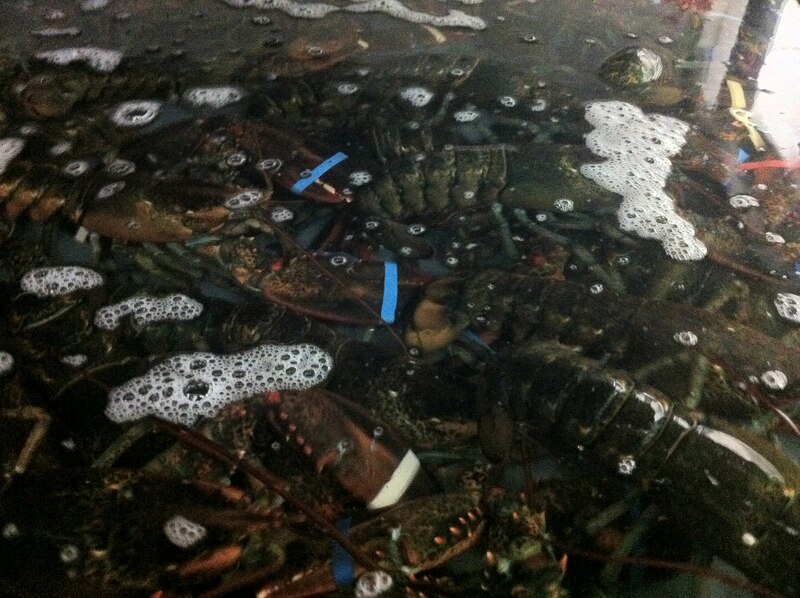 The lobster steamed or grilled (your choice) to perfection, presented in neat halves so you have all the joy of extracting the sweet claws and meaty tail section for yourselves. 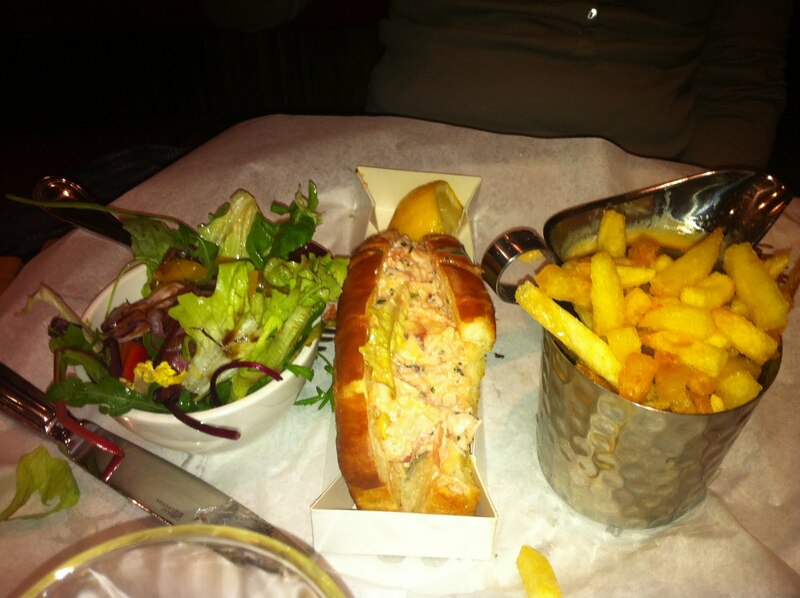 And the roll, with its sweet toasted brioche bun and carefully balanced lobster meat and mayonnaise filling, is a thing of wonder too, packed with silky fresh seafood and perfect dipped in the lemon herb butter. 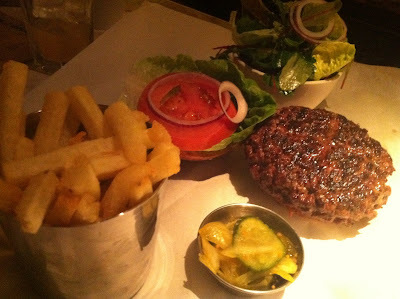 Even the fries are fantastic - golden and crunchy, aggressively seasoned and generously numerous. The question is, of course, and it's one that might have occurred to you already, is why on earth would anyone pay £20 for the burger, no matter how good it is, when an entire fresh lobster is the same price. It is a fair question, but whether or not you think burger addicts should subsidise the crustacean fans there is a certain pleasing aesthetic to a menu where everything's the same price and at least you know (barring anyone going too crazy at the bar) approximately how much the bill's going to be before you sit down. It's an incredibly attractive way of doing things - I'm a huge fan - and I hope they don't cave in to any accountant's suggestions of adding a few quid onto the lobster and shaving a few off the burger. Lobster, or burger. £20. Simple. Perfect. Oh, there's the no-reservations thing I suppose but that's just the way things are going at the moment so you may as well just get used to it. 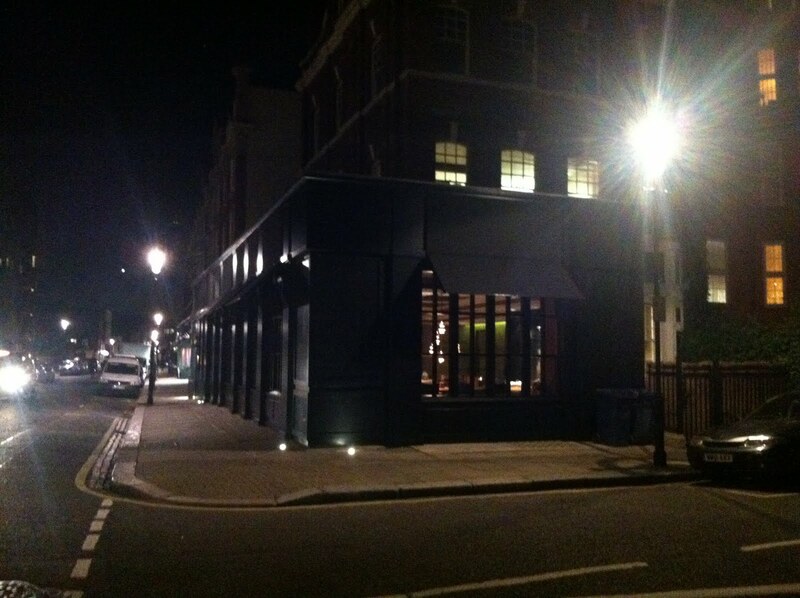 Here's a tip from me - if there's a queue, put your name down and hop over the road to the upstairs bar at Tempo. 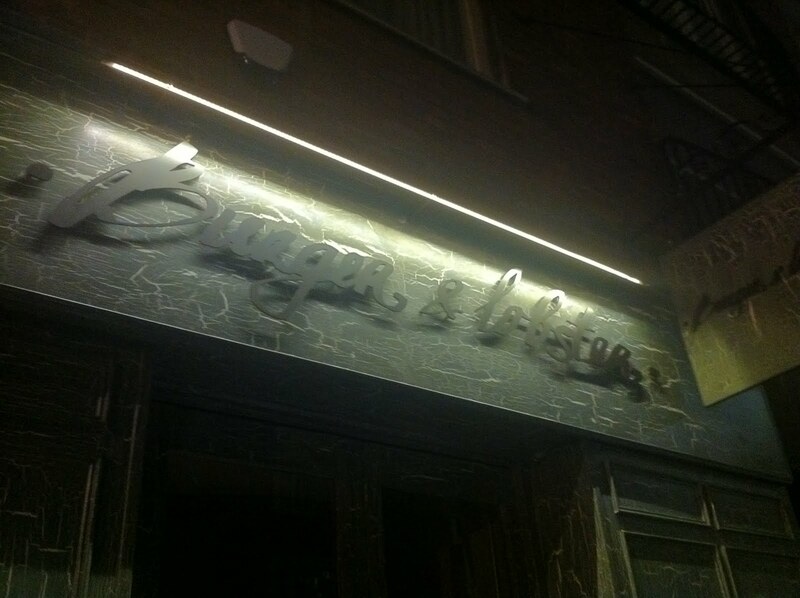 You can enjoy some of the best drinks in this part of town while you wait for your table to be ready. They'll even call you on your mobile when it is - surely that's no real hardship? Either to blame or thank them for the way I've turned out, I brought along my parents to Burger & Lobster on Saturday. They loved it - how could you not - and we talked about old holidays and great meals the way you do when you're enjoying yourself. Mum said that she remembers a conversation with a friend when I was quite small, and how she told her that I wasn't allowed to start on dessert until I'd finished off every bit of my main course. "Aren't you worried that might make him a bit greedy?" was the friend's response. I suppose it had never occurred to her. And thank God for that. There are few experiences more surreal than being the only customer in an empty restaurant and being comprehensively ignored by every member of staff. Certainly, there are times in life where the ability to make yourself invisible would come in handy - to avoid having to contribute in work meetings perhaps, or if you find yourself on the front row of a particularly confrontational stand-up comedy gig - but in a restaurant, it's not ideal. 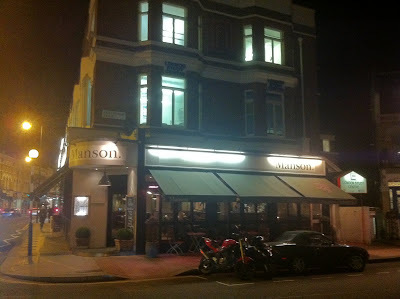 After a period staring thirstily towards Manson's handsome bar, while groups of waiting staff prodded importantly at cash registers and generally got on with the kinds of things waiting staff do when there isn't a customer at the other side of the room waiting to be served, I was beginning to wonder if the District Line had finally done what it has been threatening to do all these years and I'd died somewhere en route to Parson's Green. Not having been a particularly good Christian (I could never get over that whole "believing in God" stumbling block sadly) I began to worry I was trapped in Food Blogger Hell, condemned to pitifully flap for attention for all eternity, hungry, thirsty and forlorn. In the midst of this existential panic, my friend arrived, helpfully reassuring both that I was not dead (at least not yet) and, by the fact that she'd managed to get from the front door to the table without being greeted or even noticed, that if I was in Food Blogger Hell, at least I wasn't alone. 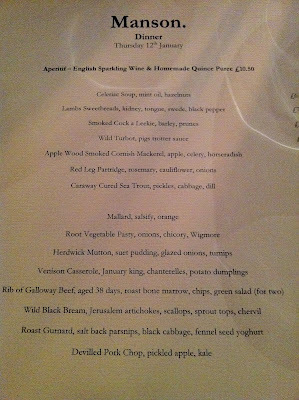 And then, finally, we managed to get served, and for the few precious minutes it took us to drink our aperitifs (sparkling wine and rhubarb, very good indeed but you'd hope so at £10.50 a glass) all was well with the world. It wasn't that the food at Manson was bad, exactly - most of it was fine, some of it was good, and it did all look the part - but it was occasionally quite... odd. 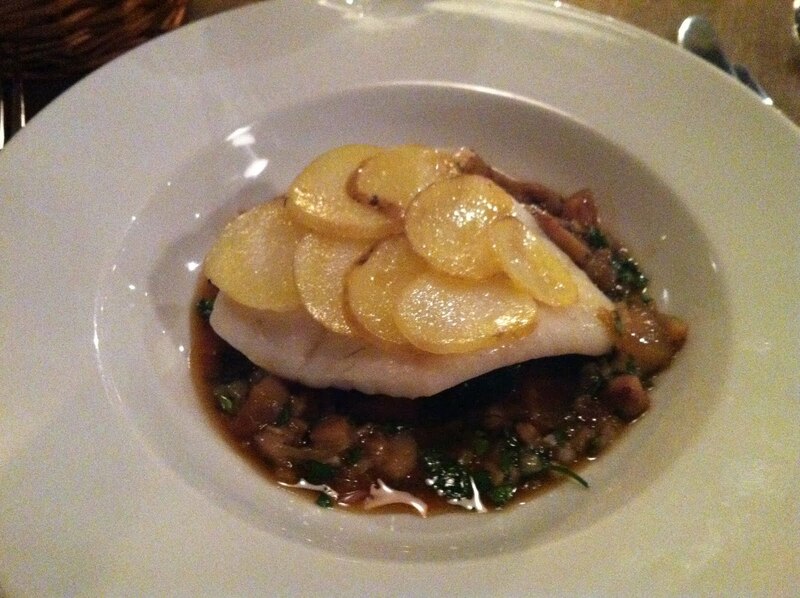 Take my starter of turbot with pigs trotter sauce; the sauce very well executed in that classically-trained way, being perfectly reduced and rich in flavour and colour, it just didn't sit very well with the fish - it felt like a sauce meant for a bloody hunk of rare venison or aged beef steak. And the fish itself was the strangest texture, not dry exactly but dense and congealed - fresh fish should break into moist flakes, but this split apart like meat jelly and I really missed a nice crispy skin. 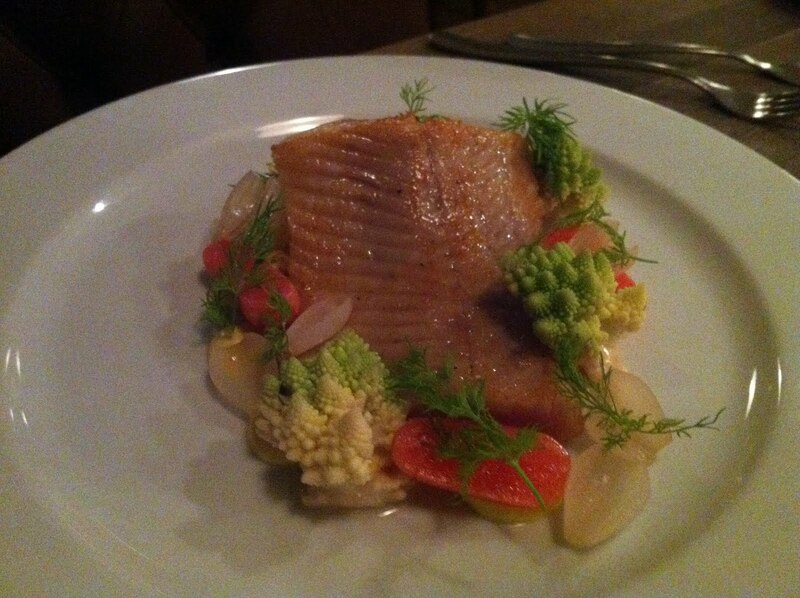 Caraway-cured sea trout though, paired with lightly pickled vegetables, was a more successful experiment and the pretty coils of Romanesco broccoli made for a very attractive plate of food. Catastrophically underseasoned Mallard (as in, it was completely unseasoned) spoiled what could possibly have been a better dish, although even without sodium's helping hand I didn't detect much flavour in the meat. It was presented in a deep bowl which at first I thought was strange until I realised the duck and the salad vegetables were sitting on top of a wonderfully rich game soup of some kind - I could have easily just swallowed a pint of this on its own as nothing else was worth the effort. 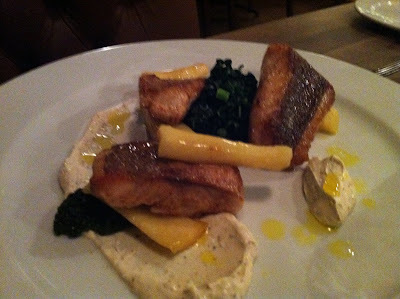 More ill-advised experimentation also affected my friend's roast gurnard - let's just say there's a reason you don't often see parsnips and fennel seed yoghurt on the same plate, although even that aside, the fish was overcooked and dry. In the manner of a line manager tasked with motivating his staff, I will follow up bad feedback with good by saying the cheese course at Manson was very nice. 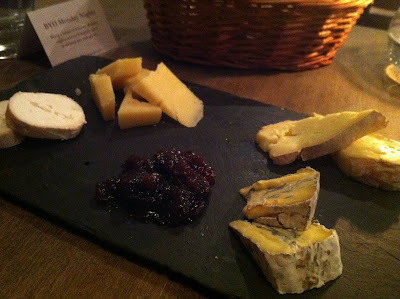 Consisting entirely of British and Irish cheeses, a number of which were unpasteurised and unfamiliar to me, we particularly enjoyed a nutty semi-hard Doddington and lovely fluffy unpasteurised goat's. Some of them had sweated slightly under the heat of the bar where they were kept but nothing too disastrous and they were generous both with the portions of cheese and the basket of crackers. I suppose it's not rocket science, serving cheese, but credit where credit's due. I'm prepared to believe that I didn't get as much out of an evening at Manson as others might. It is, after all, a lovely room in a nice part of town and although staff got off to a bit of a shaky start, once it was all underway dishes arrived at a good pace and usually with a smile. 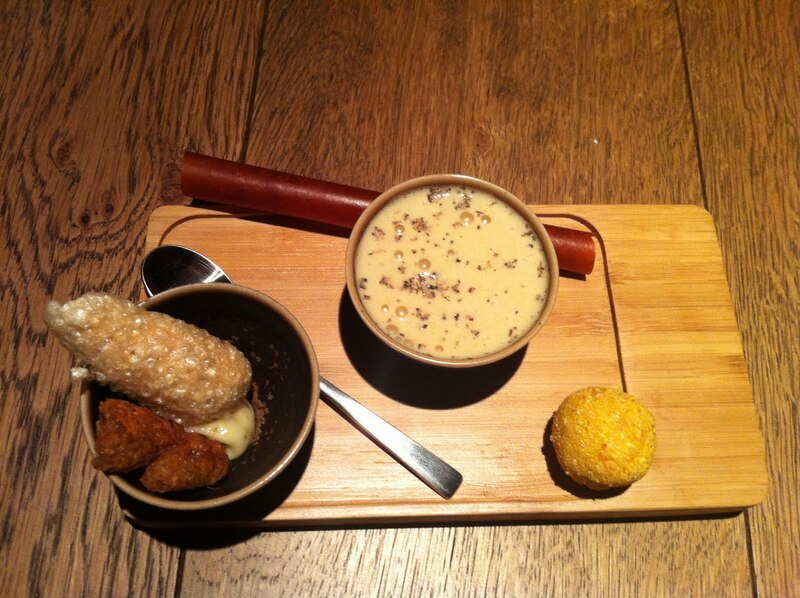 But I'm afraid there were enough mistakes with the food, and enough weird textures and odd flavours, to make me uncomfortable and I can't honestly say that I'm confident enough in their ability to pull off a good - even normal - meal to warrant a return visit.